He was a politician, a champion of accessibility and a voice for organized labour who always gave of himself and fought for the average citizen. But on Tuesday, that voice fell silent when St. Thomas Ald. Terry Shackelton, 59, died after a lengthy illness. He leaves behind three children — Terry Jr., Barb and Laura– as well as partner Lesley Buchanan. “He always truly believed in giving of himself to make the world a better place for all,” Shackelton’s death notice reads. Wednesday, municipal flags in St. Thomas were flying at half-mast in honour of Shackelton and will stay that way until the day after his memorial service on Friday. A tribute and moment of silence are planned for Monday’s meeting of St. Thomas council. Shackelton was born in Toronto on July 4, 1951, to Murray and Dorothy Shackelton. A school board employee and an active member of CUPE Local 4222, of which he served a term as president, he was an advocate for workers’ rights. He also was active as a Mason and a Shriner, and was involved in the Buddy Bear safety program. After three unsuccessful bids for St. Thomas council, Shackelton was appointed in 1999 when then-alderman Joanne Brooks was named to fill the mayor’s chair after Steve Peters ran in the provincial election. Following that term, Shackelton was elected three times and was in the running as one of 19 aldermanic candidates in this fall’s municipal contest. 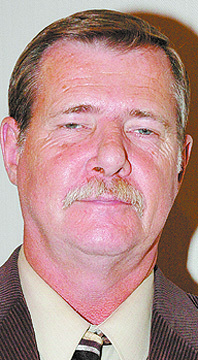 In the 2006 election, Shackelton received 4,332 votes, topping 22 other candidates in the race for seven council spots. Bev Wright was a close friend of Shackelton and met him more than 20 years ago through the labour movement — she was involved in OPSEU and he with CUPE. Wright said she worked on all of Shackelton’s aldermanic campaigns, including the most recent one. Former mayor and longtime friend Peter Ostojic also recalled Shackelton’s sense of humour. Ostojic called his friend “Shack” and remembered “the Shack smile” and his chuckling laugh. Ostojic said they talked regularly, and while they did serve on council together for five years, most of their conversations had nothing to do with politics. Ostojic said they met back in the early 1990s when Shackelton appeared in a delegation on school safety, as part of the Buddy Bear program, before council. “He did a deputation and he was the guy dressed in the safety bear outfit. It was summer day and he was dressed in the full gear,” Ostojic fondly recalled. After Shackelton was hospitalized for pneumonia six weeks ago, Ostojic says he visited his friend and talked with him on the phone. Ald. Gord Campbell knew Shackelton for 20 years, starting with labour activities. “Terry was well liked in the community and I’m sure the community was greatly saddened to find out he had passed (away). He really had the interest of the community at heart,” he said, noting Shackelton spent the last term of council as chairperson of finance and administration. Campbell described this job as a “rough row to hoe,” trying to keep taxes down during the recession. “I think that will be his legacy, the hallmark of his career. He was an advocate for the things that make St. Thomas a great city to live in,” Campbell said. Mayor Cliff Barwick said Shackelton was once a protege, coming to him in the 1980s for advice about running for council. “He was a very honest councillor who had no agenda and what you saw was once you got. He was the person who was there for the average citizen and had a special interest in transit and special interest in people who were physically challenged,” he said. Barwick noted Shackelton always showed up to council meetings, despite discomfort due to a back injury. This entry was posted in City of St. Thomas and tagged Terry Shackelton. Bookmark the permalink.